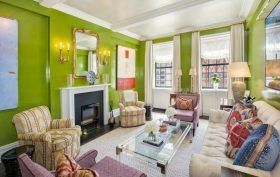 In New York City’s interior landscape of neutral hues and fifty shades of white, it’s rare to see bright colors, especially in a classic pre-war co-op on the Upper East Side. But the current residents of this apartment at 129 East 69th Street, who undertook a two-year renovation, clearly favored the brighter side of the crayon box. The best thing about it is that with eight spacious rooms, colors, patterns and fun decorating ideas never have to clash.